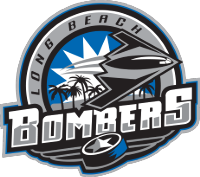 The Long Beach Bombers are excited to announce their Main Camp dates/times for the upcoming 2019-2020 WSHL season. Instructions on how to follow along as the Long Beach Bombers engage on their quest for a Thorne Cup championship. The Round Robin match-ups, dates, and times have been released for the 2019 Western State Hockey League's Thorne Cup Finals, in Ogden, UT. Long Beach Bombers forward, Artem Korolev, posts 5-point night to become just the 5th player in franchise history to record a 100-point season!